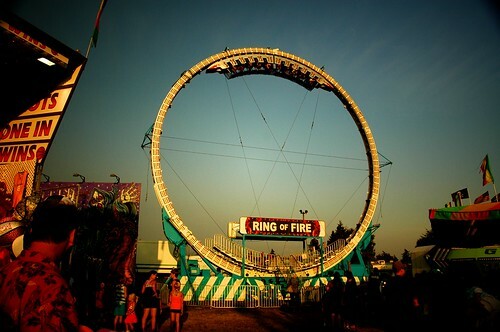 *Photo from Flickr user Evil Erin from last year’s Northwest Washington Fair. Well, if you missed the Skagit County Fair, you have a second chance to get in on some fair action this week at the Northwest Washington Fair in Lynden. It’s happening today (Monday August 16th) through Saturday. It’s the 100 year anniversary of this fair, having been started when Lynden had just 1,200 residents. (Although there was already a train between Bellingham and Lynden- I wish there still was one!) The fairgrounds have a new horse arena and expanded small animal exhibit. There are kids activities, farming exhibits, and of course carnival rides. Music headliners include Wierd Al Yankovic and Kenny Rogers, although you’ll have to pay extra to see them. There’s also a demolition derby and a motocross daredevil for you thrill-seekers. Fair hours are 9 am to 11 pm, and Carnival hours are 11 am to 11pm. Admission is $10 for people ages 13 and older, $8 for seniors 62 and older, $5 for ages 6-12, and free for ages 5 and under. You can get an all-day carnival pass for $25 or pay $3 and up per ride. The address is 1775 Front Street, Lynden, WA 98264. Check out the official website for more information about the Northwest Washington Fair.